Seems like every time I talk to a theist on-line they ask me; “Where do you think you came from? Monkeys? Ok, so where did those monkeys come from?” It represents a shameful lack of education. I know that it’s really not their fault. Through religious home-schooling, and the denial of the teaching of evolution in schools due to religious teachers and school-board members, they really have not had a chance to learn the process whereby we have arrived on this planet. That is, they are ignorant of the best explanations as put forward by the greatest minds in science: Evolution, and how it has worked to give rise to humans on this planet. So, let’s start at the beginning. 4.5 Billion years ago, Earth was a newly formed planet; it formed from material (rocks, dust and gas) floating in the area of space where gravity was forming a new star (our sun). The Earth was lifeless, hot and barren; a ball of rock and molten lava due to the heat from continuous collisions with asteroids, comets and other space debris during its formation. Floating as it was in the vast coldness of space, it began to cool; and as it cooled, it formed a solid crust on which the waters started to collect. Where did the water come from? Well, comets delivered billions of tons of water in the form of ice to the Earth’s surface during earth’s molten phase and later during the bombardment phase. Once a molecule of water arrived on earth, it was destined to remain there due to Earth’s gravity. Water vapor boiled out of the lava to collect in the atmosphere to be cooled into rain which, over time, created earth’s great oceans, rivers, lakes, and tide pools. It was probably in these tide pools that the first complex chemicals collected, and started to interact simply due basic chemical reactions. Some combined, later to break down again, forming new compounds. Amino acids, which have now been found in space, landed on the earth to add to the mix and start new processes. Before long (around 500 million to 1 billion years of combining and recombining) there arose a string of amino acids that were actually able to replicate, i.e. make copies of themselves, from the pieces of molecules that were floating in the liquid environment. These were the early RNA molecules. Some of these self-replicating molecules, entirely by hit-and-miss (but predictable) chemical processes, developed an outer shell of molecules that protected them and allowed them more stability and longer life. These shells later became cell walls, and single-celled organisms came into being. It was within these cells that DNA evolved. For the first 2 Billion years, there was little or no oxygen on the Earth, however there was huge amounts of carbon-dioxide. Single-celled plants then evolved which were able to use that abundant gas during photosynthesis which produced oxygen as a by-product (waste). Billions and billions of these tiny plants, over the next billion years, were able to produce the great quantities of breathable oxygen which multi-celled animals evolved to use. So, in the beginning, Earth was lifeless for nearly a billion years, and then it was populated only by these single-celled organisms for nearly 3 billion more years before they started to combine into larger collections of cells that were able to work together to more efficiently compete for the available nutrients in the water. 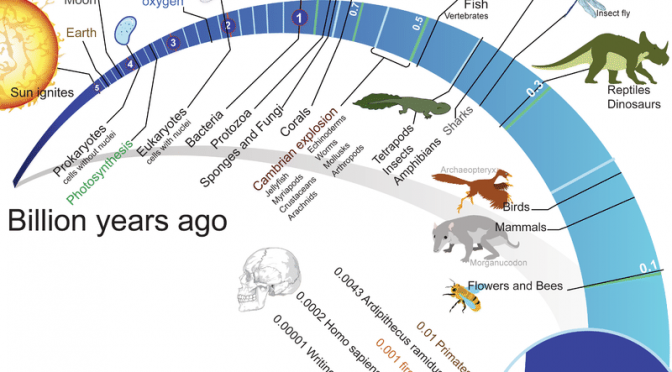 Some of these earliest organisms were sponges and jellyfish. They had no senses; no eyes, no sense of smell or hearing and only a rudimentary sense of touch; but they were able to capture and digest the other single-celled creatures and plants that they happened to come into contact with. Only about ~1/2 Billion (~500 million) years ago there came a great explosion of diversity of living multi-celled plants and animals on the Earth which we call the Cambrian Explosion. Think of it, the Earth was 4 Billion years old before the first Multi-celled creatures (plants and animals) came into being but soon the oceans were brimming with life. However, there was still little or no life on land. Plants were the first life to spread to the areas around the bodies of water about 435 Million years ago. Fish use oxygen just like land animals do, they just get it from the dissolved oxygen that is present in the water. But some fish, living in low-oxygen water environments evolved the ability to also get it from the air, and it wasn’t long before they were moving onto the land. The rest is history. And if it happened routinely in our little neck of the woods in 4.5 billion years, it wouldn’t be a stretch to think that it might have also happened in many other regions of space over the 14.5 billion year history of the universe!